Saratoga Weather scripts built the above webpage for my personal weather station. 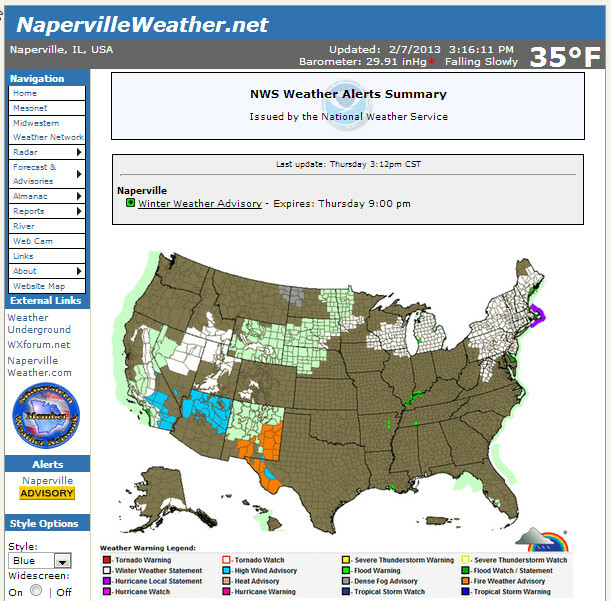 Since Feb of 2012, I have been running a version of my weather web site, NapervilleWeather.net using Saratoga Weather Scripts from Ken True’s Saratoga-Weather.org website. Ken supplies many of us home weather station enthusiasts with the php-scripts to make our local station data easy to read. We thank Ken for his work. Since my original setup, many updates, tweaks and fixes to the Saratoga Weather Scripts have been released through Ken’s site, and recent I just applied updates to over 56 files; mostly php scripts and weather image files. The update went smoothly and I wanted to use this blog entry to capture the work. From this dialog box I downloaded a 340K zip file with 56 files. I unzipped the files. I printed out the two README files, and then using them as a check list, one file at a time I copied them into my production website. For quake-json.js, this was a new file for me, and I just copied to the root folder of my website. For wu-radar-inc-php, I already had this file in place and I did a diff between the existing file and the updated file and confirmed that any customizations I may had done got carried forward. After each file I copied onto my live site, I verified that nothing broke. I run several linux machines. 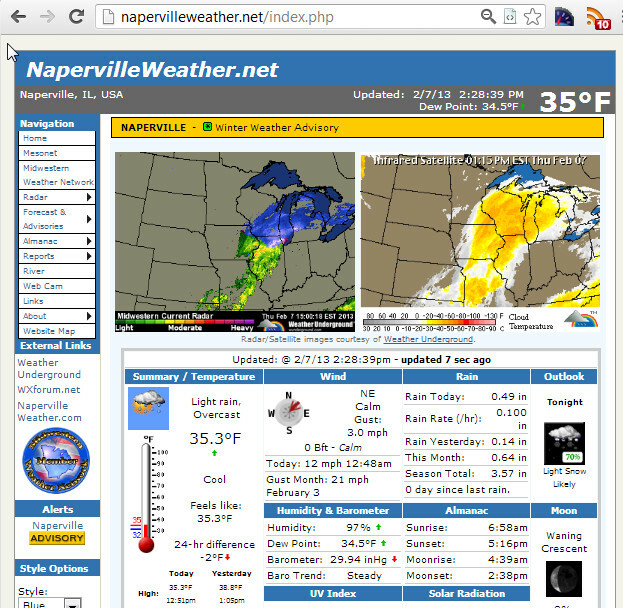 The NapervilleWeather.net website runs on a virtual machine running Fedora 16 on the RackSpace Cloud. The linux upgrade process is pretty automated, running scripts like rpm, yum, or apt-get. For the Saratoga Weather Scripts, you need to step through the updates one file at a time. That’s ok. For 50 some files, it took awhile, and maybe next time I won’t wait a year to apply updates. A version controlled image of my website is store at the github repository jkozik/saratoga – this can give you a peak at how I store the files and format my contents.